← How about a little Heelwork to Music? 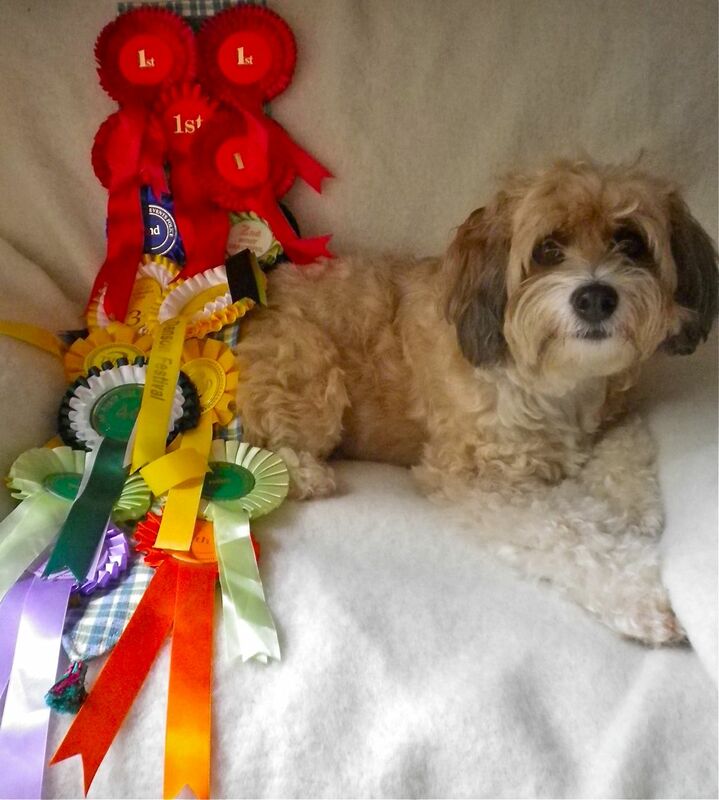 Lola-dog poses regally with her rosettes. I entered Lola into her first Fun Dog Show when she was 9 months old. Seemed like it might be fun. At that stage she was eligible for the Best Puppy category and I thought I could also rustle up a fancy dress costume. On the day I was surprisingly nervous. There were so many puppies entered that separate rings were provided for the male and female pups and there were 40 entries in each. We were a bit late, so I ducked under the rope and found a space to show off my freshly washed puppy. Looking around I could immediately see we were doomed. There was a beautiful husky with blue eyes, tiny fluffy spaniels and leggy, winsome labradoodles. Lola never stood a chance as she wasn’t classically ‘cute’ – she’s always been a bit too independent and aloof. By the time the judges (the local vet and his assistant) came to us they’d used up all of their small-talk on the little blond kids and their tiny canine best friends, and we exchanged only a desultory handful of words. As soon as they moved away to the next pair we ducked back under the ropes and wandered off. It’s one of those character-building experiences to be reminded that everybody’s puppy is the best puppy. And as we continued to attend these events that’s not all we learned. The loose rule of fun dog shows is that: “you can’t win against a child handler or a 3-legged dog’. This I learned after a 3-legged dog took home every rosette from a show in Hyde park. The ‘child handler’ bit explains itself. Somehow, these are always the entries I end up standing next too. The most obvious lost cause was during the summer of the London Olympics when I found myself alongside a retired police sniffer dog with crippling arthritis, whose wheelchair was decked out patriotically to represent the British murderball team. I chatted to the dog’s owner for a while, then sighed deeply and put on my best beauty pageant smile. Lola and I did not make the cut. Most fun, companion, or novelty dogshows run through the summer from May to September and it’s a great way to spend a summer afternoon. Share the experience with friends, or take a picnic. If the event is also hosting a breed show the classes can be a lengthy drawn-out process as judges wait for handlers who are attempting to show in two rings simultaneously. Take something to sit on, snacks, water, grooming tools for your beautiful dog or props for your clever dog’s tricks and maybe something shady if it’s very hot. Lola never entered a show as a puppy again, but she’s won rosettes for being pretty, trying to march, catching treats, doing tricks and being slightly more obedient than some other dogs. I think we have enough now. We will continue to enter competition obedience shows though, and maybe one day earn a ribbon in a recognised dog sport. If you live in London one of the best ways to find shows and other dog events is the London Dog Forum, a website with a lot of useful information for dog owners. A Yahoo group called ‘Fun’ Dog Shows lists companion shows on its database and Cobbydog (a dog food company) have a similar list, although few of these occur in London. For those who are wondering what Lola’s fancy dress costume was like, here she is, resplendent as Brian the snail from The Magic Roundabout. This is Lola as Brian the snail from The Magic Roundabout. 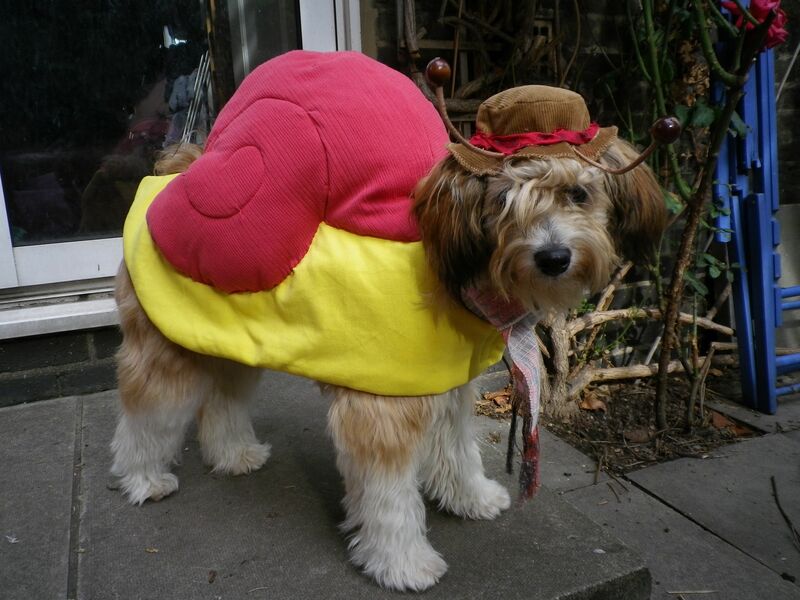 Or possibly “Dougal dresses up as Brian the snail”. This entry was posted in Uncategorized and tagged companion dog shows, fun dog shows, handler, prettiest dog, ribbon, rosette. Bookmark the permalink. your blog posts. After all I’ll be subscribing in your rss feed and I hope you write once more soon!